Do you change the channel when you see an ad for the Gardasil vaccine? Maybe you are a man and don't think you are at risk of acquiring cancer from HPV, maybe you aren't sexually active, or maybe you don't have the resources to get the vaccine. But research shows that in addition to causing cervical cancer in women, certain strains have been linked to head and neck cancers in men. The Gardasil-9 vaccine protects against nine of the most cancer-associated strains of HPV, though there are more than 100 strains of HPV with possible adverse effects. In light of this, Arizona State University is aggressively pursuing research aimed at understanding the underlying mechanisms behind the HPV infection and exploring preventative measures to stave off the virus. In a recently published paper, researchers Hugh Mason, an associate professor in the School of Life Sciences and the Biodesign Center for Immunotherapy, Vaccines and Virotherapy, and Andy Diamos, a postdoctoral researcher with Mason's lab, shed light on a more affordable, plant-based vaccine that stimulates a strong, broadly protective immune response against the virus. The current approach to the Gardasil vaccine is to produce strain-specific virus-like particles (or VLPs), which are composed of the virus' capsid protein but none of its infection-causing DNA. The immune system still recognizes this protective shell of the virus and stimulates a response, but the vaccine does not contain any infectious agents. Each of these virus-like particles, however, only protects against one strain of HPV. "If you are going to get protected against one of those, you won't be protected against others. The way that the Gardasil vaccine has been trying to get around this is by essentially making a ton of VLPs and mixing them together into the same vaccine. Gardasil 9 is nine of these individual vaccines mixed into one," Diamos said. "That is also why this is one of the most expensive vaccines on the market. It would be great if we could come up with a simpler vaccine that protects people against multiple strains of HPV." So the researchers set out to find a broadly protective target. Currently, the highly specific L1 capsid protein is utilized in vaccines, but another protein labelled L2 has not been explored in as much detail. The L2 protein is conserved across different strains of HPV, but it has been known to produce a poor immune response. If researchers were able to find a way to boost the immune response to this capsid protein, L2 could be used to produce broad-based protection against multiple variants of HPV. "If you could convince your body's immune system to care about this protein, then it could protect people against lots of strains at once. That was the idea behind our vaccine—to take this protein that is highly protective and find a way to make it highly immunogenic," Diamos added. The researchers utilized two different vaccine strategies. First, they made an HPV VLP by attaching the L2 protein to a pre-existing hepatitis B virus-like particle, and then they made a recombinant immune complex by fusing the L2 protein to an antibody. Both of these approaches, when used in vaccines administered to mice, produced a strong immune response, but when delivered together, the improvement was impressive. "What we found is that either of these two platforms (with this L2 antigen) can produce pretty strong antibody responses, but when we administer them together, we get a synergy that is greater than the additive effects," Mason said. The fact that these recombinant protein expression systems were produced in plants sidesteps some of the traditional challenges posed for other vaccines. 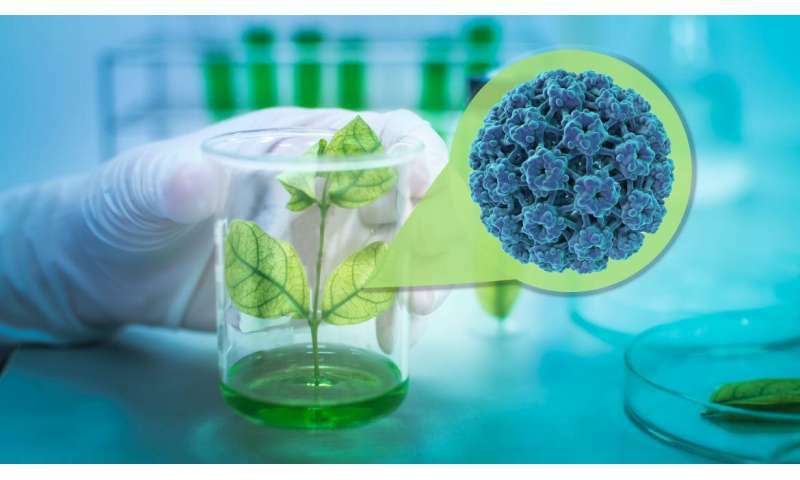 "We believe plants are a good model for expressing recombinant proteins because they are very easy to culture and thanks to developments in the last few years, we have been able to attain high levels of expression," Mason said. "Using viral vectors, we deliver them into the plant system, they produce multiple copies of the gene that enhances the level of protein expression, and moreover, we can extract and purify the protein from plants, and purify it in a relatively straightforward way." "Ultimately, we think that plants can be a cheaper way to produce many of the recombinant proteins that are produced in mammalian culture systems, which are very expensive and require very expensive media and facilities to grow the cells." Although plant-based vaccines have a long way to go before they are approved and hit the market, they are associated with a lower cost in addition to a lower risk of external pathogens. "The general idea is that when people make complex proteins, they use mammalian systems, and that's problematic because they have to grow these mammalian cells in sterile bioreactors, which doesn't scale up very well," Diamos said. "Compare that to growing plants—you water them, you give them light and they grow. Plants also don't harbor animal pathogens." The current study describes a potential HPV vaccine while also assessing the validity of plant-based systems for vaccine development. The primary goal, however, was not to develop a full-fledged vaccine, but to better understand how different vaccine strategies improve the immune response to broadly protective HPV proteins. "We see this as a way to better understand the immune response and what it will take to get a high enough antibody response to be protected or to obtain a longer-lasting immunity," Mason said. Such research is of particular medical significance as an effective HPV vaccine because it will not only suppress the symptoms associated with the virus, but also help prevent the emergence of HPV-linked cancer. "For cervical cancer in women, HPV infection of the cervix will often ultimately lead to cancer and thus, the HPV vaccine is really an anti-cancer vaccine," Mason said. This vaccine model is also viable for other infectious agents, which are being studied in Mason's lab. "We actually have an NIH grant being reviewed currently that focuses not on HPV but the influenza virus, using a highly conserved viral antigen for a broadly protective vaccine," Mason said. Eventually, the researchers would like to test the vaccine on humans or nonhuman primates, to further establish its safety and efficacy.